Fast Disposal of Your Old Couches, Lounges, Tables & More. Get the Professionals to Remove Your Old Furniture. Got Old & Broken Furniture to Remove? It’s hard to imagine what life would be like without council curbside garbage bin collection services. With over a million bins emptied every week, Sydney residents are clearly producing a lot of waste. For the most part, the curbside service is more than enough to keep homes free of the weekly trash. There’s not many rubbish items that won’t fit into the garbage bin, most bins are pretty big. However, when it comes time to dispose of furniture, like an old set of chairs, you might run into some trouble! Whether it be worn out couches, broken cabinets, old mattresses, or any other type of furniture, you need Same-Day Rubbish Removal take them away. No matter the type or size of furniture, it will be no trouble for our experienced team. We’ve been doing all kinds of rubbish removal jobs throughout Sydney over the last decade – there hasn’t been anything too hard for us yet. Call us today on 0402 737 046. Apart from the thorough, fast, and friendly service we offer, the thing you’ll probably love most is our pricing. Furniture can be difficult to remove. For large items, trying to take them to the local tip can be nearly impossible without a large ute or trailer, you may have thought about breaking it up into small pieces, but this can sometimes be more work than it’s worth. Another common idea is to hire a skip bin, these can often hold a lot of junk, but often these are more work and money than expected. 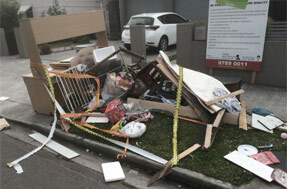 When you have Same-Day Rubbish Removal come to collect, you don’t have to worry about these things. We will do all the work for you, just direct our friendly team to the old furniture or other junk that you need to go, and we’ll take it away – you don’t even have to lift a finger! By doing everything in one trip, we save you money – we’ve optimised our process over the years, making us the cheapest option for furniture removal in Sydney. There are several reasons as to why you may have found furniture removal troublesome. As mentioned previously, finding a way to take it away can be tricky if you don’t have the right vehicle. It may be difficult to move, people often find creative ways of shifting new furniture into a house when there is nothing in there, but once the house fills up with things, taking that furniture back out can seem almost impossible! The weight of the item may be the problem, old pianos can be extremely heavy, and without the right equipment, there is next to no chance of someone shifting one alone. One of the biggest worries of removing furniture yourself is the risk of injury. The Australian Bureau of Statistics reported 181,200 injuries from ‘Lifting, pushing, pulling or bending’ in just one year – these actions are all usually used when removing large pieces of furniture. The trouble of having old furniture lying around is nothing when compared to a possible injury. Our team are lifting and moving large items all day, every day, so they’re conditioned for this sort of job. They also have all the tools needed to get your junk out of your house or off your property and up into the truck. These are just a few of the common furniture removal jobs – you’d be surprised at the wide range of items we remove, we’ve seen just about everything when it comes to furniture disposal! If you’ve ever taken your own items to a tip, you’ve probably looked out over the landfill and seen a few things that you thought looked alright. If some of the stuff was so good, you may have even taken things home! A commonly dumped item that may have even stood out to you is furniture. We hate seeing good things, whether it be furniture or other items, being sent to landfill. People are causing huge problems for the environment by their waste disposal habits, and we’re trying to change that. Whenever possible, we do everything we can to make sure that your junk, whether old furniture or other household waste, is disposed of responsibly. We would prefer that you found a new home for your furniture, so we’d encourage you to look around for someone who may want it before calling us. If you can’t find a new home or another use for it, then we’ll do what we can to have it recycled. Don’t let someone else take your stuff to the tip, have Same-Day Rubbish Removal dispose of it responsibly. Whether you’ve got old lounges, couches, beds, mattresses, chairs, tables, cabinets, shelves, or even large whitegoods like broken washing machines, you need to call Same-Day Rubbish Removal. Whether your property is located down in the Sutherland Shire, in Sydney’s CBD, or up on the Northern Beaches our team has you covered. Our team is ready to go and can be at your location in a flash. If you’re ready to have your old furniture removed and would like the fastest and cheapest rubbish removal service in Sydney, call us now for a free quote on 0402 737 046. You won’t be disappointed!